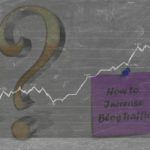 In a previous post we explained how to use AdSense to monetize a blog. We also explained how easy it is to lose your AdSense account. So what if Google fails to approve your site for AdSense, if it has disabled your account or if you prefer not to use AdSense at all? What are the alternative advertising networks that share their revenue with publishers, and what other ways are available to you to make money from a blog? 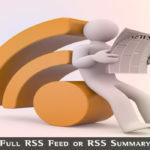 Here are our top 5 suggestions that you can use as AdSense alternatives. You must keep in mind that Google AdSense is unique in the way it publishes PPC adverts on your site. It uses a patented contextual analysis algorithm to establish the content on each individual web page or blog post. It then places relevant adverts into the blank ad units you have selected. Most alternatives to AdSense are unable to use this technology, so the way adverts are chosen is slightly different. 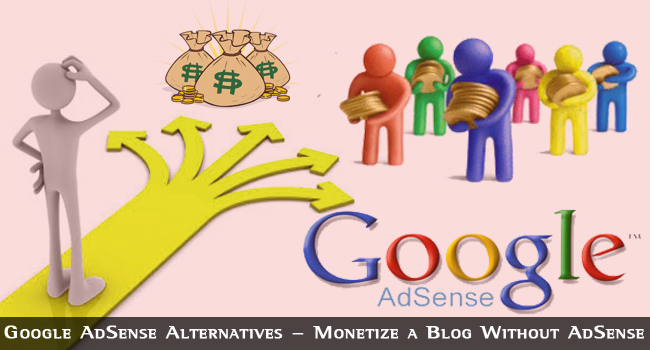 You should also be aware of the fact that none of these alternatives will make you as much money as AdSense can, because Google is unique in offering you as much as 68% of the bid price for an advert using specific keyword – with one exception that we shall discuss later. While our top 5 may be second best, you would not be considering them unless there was a reason for you either not wanting to or being unable to use AdSense. These AdSense alternatives allow you to make money by publishing adverts on your site with very little effort – it is residual income that involves very little work on your part. Bidvertiser is a realistic alternative to AdSense, although it can take a while to get up to speed to significantly monetize a blog. That is because it works by means of a bidding system that enables the highest bidding advertiser to place ads on your site, and it takes time for them to find you. The more authoritative your website or blog, then the higher-paying PPC ads you will be able to show. You get paid a proportion of the bid price whenever an ad is clicked. The adverts themselves are very similar to AdSense, and you can customize them to suit the look of your site. You can use banners, skyscrapers and ad units in line with your text. and you will be emailed an Activation Code. 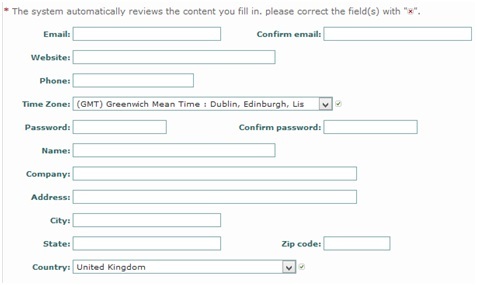 Enter it where indicated, and you will then find a form where you enter a category for your site. You will then get an Ad Code which you can enter wherever you want the adverts to appear. Unlike AdSense, you can add as many ad units as you wish. You can get paid via PayPal with a minimum payment of $10. Checks are paid out only if your income reaches $100. 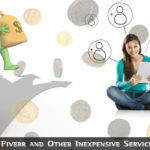 Although Bidvertiser is one of the best AdSense alternatives around, it does not pay as much for clicks. However, you can use it on multiple pages or posts, and also on multiple sites for maximum income. I like to trasfer these small transaction from paypal to western union, so that I can send some small change to my grand kids. Bidvertiser also runs a referral program. You get paid when advertisers pay for clicks, and those that publish the ads earn money from these clicks. It’s a win-win situation. Just like Bivertiser, Chitika enables you to make money by posting ads on your web pages or blog. This has been a popular means of making money from a blog or website for many years, and many people prefer it to AdSense because of its advertising options. Many people find Chitika useful for generating a reasonable income. However, others may find that their readers react badly to this type of advertising, which can interfere with their reading experience. This is a different way of advertising from the type of visible text or image ads that AdSense and Bidvertiser provide, and some claim that it works better on blogs that static websites. The fact that many review sites judge Chitika to be the #1 competitor to AdSense indicates how easy some find to use it generate income. Other sites go for Bidvertiser, but there are alternatives to these that might suit your blog better. Chitika Linx: An advertising system that automatically identifies relevant keywords on your page, and then links these to relevant adverts. The linked keywords are identified by a double underline. 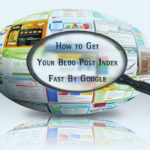 If your web page or blog post is mainly text then this might be your best option. Hover Ads: These are adverts that hover on the bottom right of the visitor’s screen. They remain there as the reader scrolls down your page. They are visible on all devices including mobiles. Highlight Ads: If a visitor to your site highlights text on your page for any reason, they will see an advert based upon the keywords highlighted. These adverts are only visible while the text remains highlighted. Referrals: This is an additional way to make money. Chitika offers you 10% of the income of new publishers you persuade to sign up. This is active for 9 months from them signing up, and you are provided with a selection of advertising banners. Signing up is very easy, and everybody generally gets accepted unless their site is involved in “any pornographic, hate-related or violent content.” Visit their home page and click to start an account. You get a confirmation email, and when you click the link you get the sign up page. You can then begin to set up your account. You then choose the type of advertising app you want to use and get started. You can choose PayPal or check. If you choose PayPal there is a $10 threshold, but if you select to be paid by check, then you must make at least $50 before you are paid. Payment is monthly, so if you make $30 one month, you will need to make $20 the next month to be paid by check. Media.net and Bing have collaborated to create a competitor to AdSense, though they do not admit that this is what it is. It is fundamentally a partnership whereby Bing offers the contextual analysis of web pages and blog posts, and online advertising company, Media.net, provides the adverts relating to the content of specific pages. Content ads are related to the content of the page, and are available in a range of dimensions. This type of advert is similar to those of AdSense. Search targeting ads, where the advert is shown only to search engine users and is relevant to the content of the web page listed. These can pay well according to the niche, although generally, the content ads pay best. Visit media.net and click to ‘Request an Invitation.’ This works very much as AdSense does, in that you provide your details including your website, and Media.net will check it out using Bing and either approve or deny your application. There are several aspects of your website or blog that will be considered. It must be in English, have good quality content and meet the required guidelines that bar the usual types of website. Your site must also have a certain level of traffic from the United States/Canada/United Kingdom. Other than that, Media.net operates in a similar way to Google AdSense, although the adverts are not from Adwords but from the Yahoo-Bing network. This is likely to continue as long as the Yahoo-Microsoft partnership lasts. Until then, Media.net is a realistic alternative to AdSense, although it will always be a second cousin in terms of potential income. It’s one big advantage is that it pays more in PPC terms than any other alternative to AdSense. However, it is based upon a search engine with a great deal less traffic than Google gets. Media.net pay within 30 days once you have earned $100 – via PayPal or Wire. However, some people have reported having their accounts suspended after earning more than $800, so this service can be as fickle as AdSense in suspending your account. Infolinks searches out keywords in your page or post and converts them to links hyperlinked to adverts related to that keyword. You have likely seen web pages where certain words appear in blue or with blue underscores. These are indicative of this type of advertising, though not necessarily all Infolinks (some may be Chitika or other ads.) 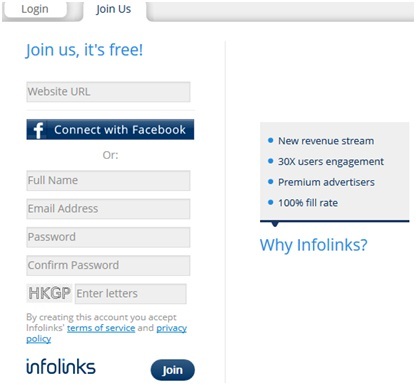 Other advertising systems use this technique, but Infolinks is way and above the best for income in our view. Intext: the program searches for keywords, and when a visitor hovers over it a bubble ad appears. You get paid per view and per click. InFold: Infolinks analyzes the search term used by your visitors, and creates a pop-up ad at the bottom of the visible screen (the fold.) The reader can choose to click (when you get paid) or it minimizes after a few seconds to a headline. InFrame: Some large screens show white space to each side of your blog. If the program identifies this, it fills this space with advertisements. You get paid every time a click is made. It’s fairly routine. Provide the information and you are in. Once your site has been approved you can easily integrate it with Infolinks using plugins suitable for the WordPress, Blogger, Joomla and Drupal CMS platforms. 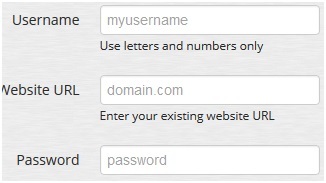 It is also easy to add the coding to a regular HTML/CSS website. You can choose PayPal, eCheck, Payoneer, Bank Wire, Western Union or ACH. ACH is available only to U.S. residents, and Payment is initiated at $50, other than for Western Union or Bank Wire where it is $100. Check for payment charges, because PayPal seems lowest in that respect. A Bank Wire will cost you $25. Infolinks is a good option if your blog or website is mainly text and your topic easily defined for adverts (e.g. sports equipment, hobbies and consumer goods.) Otherwise, you might be best with a contextual advertising program such as Media.net. Clicksor is a good alternative to AdSense, offering 70% and up to 85% of the click price. It is less strict than Google in its TOS, and you are less liable to have your account suspended than you are with AdSense. Interstitial ads are exposed to visitors to 5 seconds on a separate window dedicated to a page provided by an advertiser. It then disappears, and the reader can carry on reading the text on the page. According to the TOS of Clicksor, you can place just one advert per page, although if you choose a pop-up or DHTML hover ad, then you can place a lot more. Clicksor is one of the few PPC ad programs able to place contextual ads on your pages in much the same as AdSense does. It can use the semantics on your page to establish its main theme, and provide adverts that relate to that theme. In that respect, Clicksor is very similar to AdSense, and your click through rate with Clicksor should be higher than that with other advertising programs mentioned here. You have no need to list the keywords relating to your web pages, because these will be established by Clicksor’s contextual algorithm. You then get a confirmation email and you can take it from there. Although you state only one website in the sign-up form, you can add as many sites or blogs as you wish once your application has been approved. You get paid each 15 days via PayPal with minimum earnings of $20, or a dollar check with a minimum of $50. You can get paid by Wire if your earnings reach $1,000, although a $75 service charge is also applied for this service. If you do work hard on such PPC programs then you should make money. However, you cannot use them all, so how do you find out which is best for you? How can you test each to establish which you should use? Here is one idea that has proved successful for most of those who are making a living by publishing PPC adverts on their websites and blogs. A great deal of your success with these options will depend upon the nature of your website or blog and the quality of its content. The more authoritative sites in any niche will tend to get most traffic, and any form of on-page advertising relies on traffic. However, you can test the worth of each of these on your own blog by split-testing. The best placement of such ads. It can take some time to carry out all these tests, but it will be worthwhile. Never make two changes at the same time on any page or you will never know which was the one that worked. Ultimately, you will be able to establish the best of these options for your blog, and the best type of advert. Then you will be making as much money as you can from your AdSense alternative. Monetizing a blog without AdSense is not easy but it can be done with bit of work. Affiliate Marketing: This is where you sell products belonging to other people for a commission. Many people make a living doing this, and there are many approaches to affiliate marketing you can use. Check out our post Affiliate Marketing vs. AdSense for more information on this. CPA Marketing: CPA is short for ‘Click per ‘Action’, where you place adverts on your blog and you get paid if a visitor takes a certain action over and above clicking on the link. Such actions could be offering an email address for future contact, providing full contact details or even clicking to accept a free sample. Find more details about CPA on out blog post CPA Marketing. Many people make money using these techniques, but they involve more interaction from your readers than just clicking on a link. Nevertheless, they are worth thinking about as alternative ways of monetizing your blog or website. These are our top 5 Google AdSense alternatives. Like any alternatives to AdSense they tend not to pay as much, but if you have been refused an account, or your account has been disabled, these are our picks as the best. Like any other way of monetizing a blog, you have to work at it. CPA and affiliate marketing are viable alternatives but tend to require more personal involvement than simply putting up some PPC ads as an alternative to AdSense.